Who can resist the demands of Lady Keisho-in, the shogun’s imperious mother? Certainly not Reiko, the feisty wife of Sano the samurai, the shogun’s chief investigator; the very pregnant Midori, wife of Hirata, Sano’s trusted retainer; or embittered Lady Yanagisawa, the neglected wife of the shogun’s second-in-command, chamberlain Yanagisawa (who prefers men, especially police commissioner Hoshino). So the women accompany Lady Keisho-in from Edo to Mount Fuji. Their loyalty is poorly repaid when their entourage is slaughtered and they’re kidnapped and imprisoned in a decrepit island fortress. 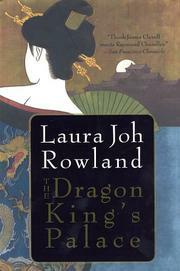 When a ransom note arrives declaring that they will be freed only if the shogun executes Hoshino, the shogun assigns archrivals Yanagisawa and Sano to the abduction while the rest of 17th-century Japan begins maneuvering, since whoever rescues the shogun’s mother will surely earn his gratitude. Sano (The Pillow Book of Lady Wisteria, 2002, etc.) sends Hirata to investigate the crime site, and he tracks down Hoshino’s enemies as Yanagisawa plots his own ascendancy. Meanwhile, the abductor, the seriously demented dragon king, is lusting for beautiful Reiko, whom he has confused with someone named Anemone. As Reiko fights to maintain her honor, Midori gives birth, Lady Yanagisawa drifts in and out of sanity, the shogun’s mother vociferously complains, and their menfolk sift through clues until they finally identify the women’s location and begin marching on it—to the deep relief of Hoshino. A lively dissection of the samurai code of honor, sexual dishonor, palace infighting, and ancient Japanese mores.